A black and white photograph of George Brown (father of Alex Brown). This photograph was on the back of the third leaf of Alex Brown's album and located in the bottom left pocket. This leaf had 4 pockets for photos on each side. In the top left pocket was a photo of a death notice for Joseph (Joe) Robert TOBIN. The top right photo was of Soldiers at Whitby Military Hospital, 1917. At bottom left is Geo. Brown and bottom right a photo of two soldiers. Alex Brown is a local Whitby area veteran. He is a member of the Royal Canadian Legion. George Lawrence Brown was born at Seagrave, Ontario on July 8, 1896. 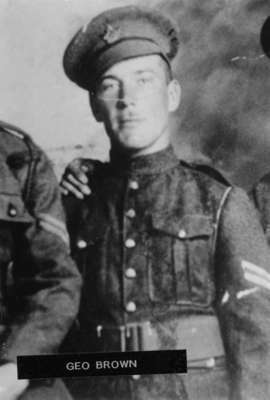 He served for four years as a corporal in the 116th Battalion during the First World War and he served as Squadron Quartermaster Sergeant at Camp Borden during the Second World War. He was awarded the Efficiency Medal in 1944 and spent 30 years in the Ontario Regiment Reserve. He was employed by Whitby Public Utility Commission from 1922 to 1962 and was a member of the Royal Canadian Legion, Whitby. He died at Whitby on August 3, 1963 and is buried at St. John Roman Catholic Cemetery, Whitby.